So I was watching an old and forgotten fight on YouTube the other night, as is my wont. Julio Caesar Chavez was pretty much making a fool out of “Lighting” Lonnie Smith. Meanwhile, Ferdie Pacheco was calling the blow-by-blow, along with Mike Tyson, who was still the premiere attraction of the sport of boxing at the time. The fight itself wasn’t particularly exceptional. Chavez, who was in his prime, was easily walking down Smith, who was trying in vain to slick his way to an improbable victory. What WAS interesting, however, was a comment Tyson made. When speaking of the fight at hand, “Iron Mike” harkened back to Jack Johnson’s battle with “Fireman” Jim Flynn way back in 1912. At that moment, I remembered something most of us had forgotten about Tyson – the fact that the man is a legitimate boxing historian. Back when I was in high school, Tyson, still in his early 20s, was on network television discussing five great heavyweights from the past. If memory serves me correctly, they were Ali, Marciano, Louis, Dempsey and Johnson. The show wasn’t a gimmick. Tyson really knew what he was talking about. As far as I know, Ali never hosted such a program. Same for Marciano, Louis and Dempsey, all of whom lived well into the era of television. Which brings us to the present. 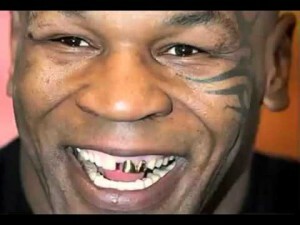 The latest news on Tyson is he’s trying to become a promoter while recovering from his addictions. Good for him. He might well give other fighters a better deal than he got. What Tyson might want to consider, however, is the possibility of being boxing’s grand old historian. Don’t laugh. Listen to Tyson speak about boxing history for two minutes and you’ll realize he’s the Quentin Tarantino of the fight game – a participant thoroughly enthralled with the subject of his life’s work. Seriously. The man’s knowledge is encyclopedic. So why should Tyson risk spending the rest of his life inspiring pathos and/or eye rolls? Boxing is clearly not in a good place right now. Money Mayweather extravaganzas aside, the sport is truly being marginalized. Mixed Martial Arts has something to do with it, of course, but public apathy began long before the rise of Dana White. In fact, the America’s general interest in boxing seemed to fade along with Tyson’s once illustrious career. Yet no one can’t deny that boxing has been an important part of American pop culture. John L. Sullivan was the world’s first sports celebrity. Jack Dempsey may well have been more popular in his time than the great Babe Ruth. Muhammad Ali went so far as to transcend the sporting world entirely. And Tyson…well, we all know the story of Tyson. Past behavior notwithstanding, it’s easy to picture Tyson not only hosting, but actually producing, a high end miniseries on, say, the National Geographic Channel, about boxing and its impact on society (hey, National Geographic did a hell of a job with its recent miniseries about the fall of the Mafia, so why not boxing?). Better yet, he could it for HBO or Showtime. Of course, Tyson will always be remembered for his ring exploits. That’s how it should be. The man was so completely dominant in his day, he became a household name. Few athletes in any sport can make such a claim. Back when he had D’Amato or Rooney in his corner, “Iron Mike” frightened as much as he impressed. No fighter before, or since – with the exception of Dempsey – exuded such ferocity. Now it’s time for Tyson to exude respectability.